April 2014 - Alpha Design & Marketing Ltd.Alpha Design & Marketing Ltd.
Contracts – are they worth the paper they’re written on? We’re encouraged to have contracts to protect every aspect of business life – but what are they really worth? In my experience, people will breach them if they are so inclined and, unless you have the appetite and money to take the offender to task, there is very little value to the contract. But let’s look at this more positively. A contract is the detailed, written form of an agreement between two parties and that is all it can ever be. There is however a much stronger and more effective contract that is never written down. It is the contract of trust. 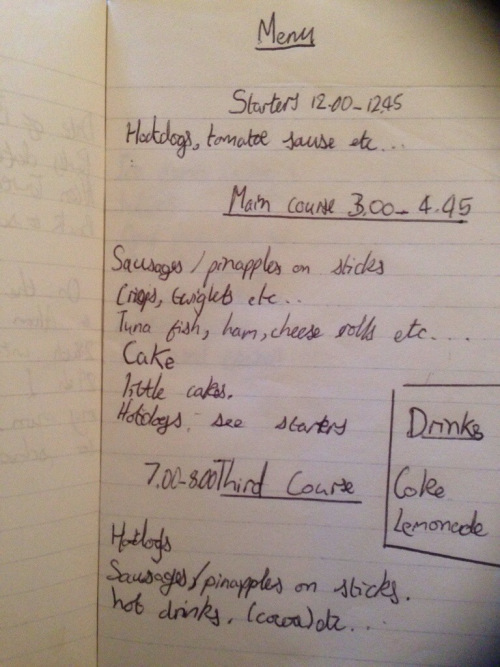 This menu, found in a notebook recently, was written by my son aged 11. It was preceded by a guest list and followed by a list of presents he hoped for. The present list included computer games, an England shirt, cocktail cherries and “some real good trainers”. 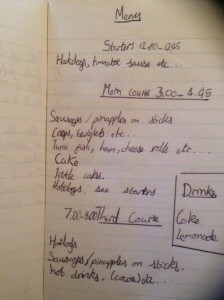 Apart from showing that he really loved hotdogs, this book, blank apart from 3 pages, gives me an insight into his thoughts at that age and takes me back to my own situation at that time. It was 1989, the year I started Alpha.